"Into the valley of Death rode the six hundred," but none returned. 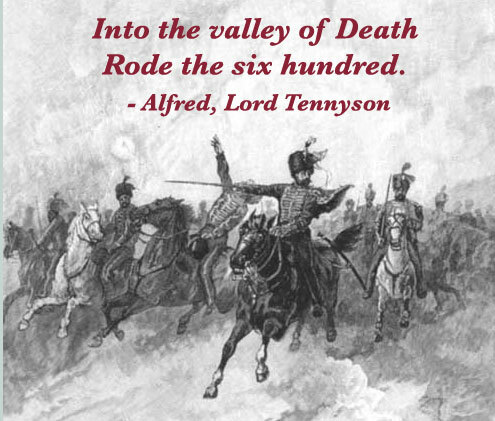 Set in 1854 in the bloody but highly forgettable Crimean War, Tennyson's classic poem recalls a futile yet heroic cavalry charge. Ponder the question of when heroism crosses the line into stupidity - when doing one's "duty" to country (or family or church) without question becomes immoral rather than patriotic. Extend the question across history, including when Nazi soldiers faced the choice of following orders or committing the treason of insubordination.